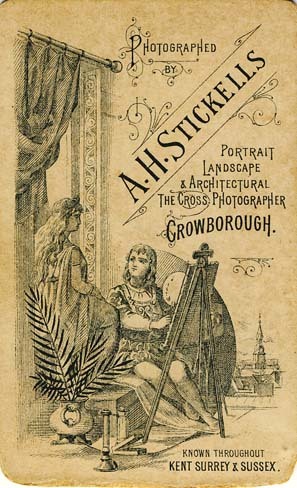 [ABOVE] The trade plate of A. H. Stickells of The Cross, Crowborough, printed on the reverse of a carte-de-visite portrait (c1899). 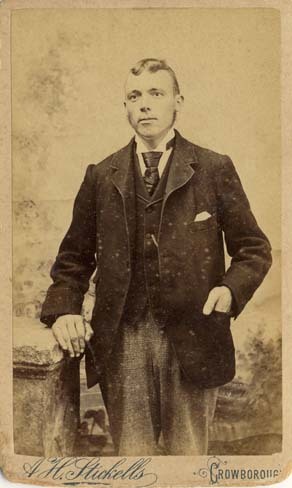 [ABOVE] A carte-de-visite portrait of an unknown man, photographed by A. H. Stickells of The Cross, Crowborough,(c1899). 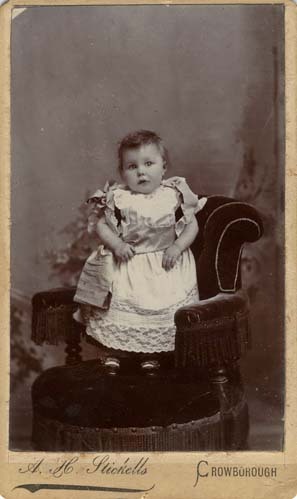 [ABOVE] A portrait of "Annie Ida Gladys Barnes, aged one year" a carte-de-visite photograph by Ambrose Henry Stickells of Crowborough (1904). Annie Barnes was born during the 3rd Quarter of 1903. 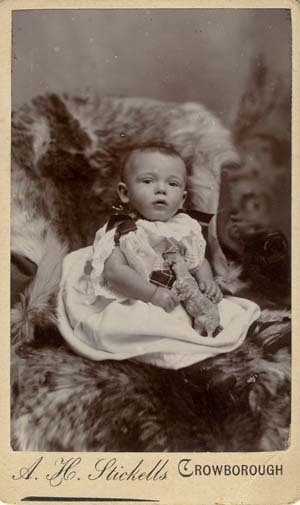 [ABOVE] A portrait of a baby holding a toy animal, a carte-de-visite photograph by Ambrose Henry Stickells of Crowborough (c1903). 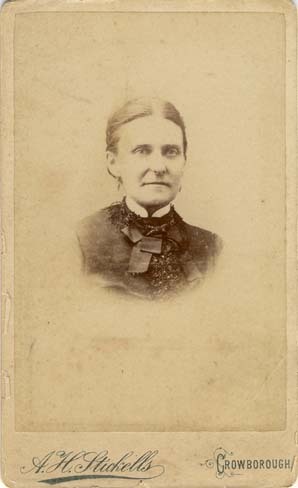 [ABOVE] A vignette portrait of an unknown woman, a carte-de-visite photograph by Ambrose Henry Stickells of Crowborough (c1902). 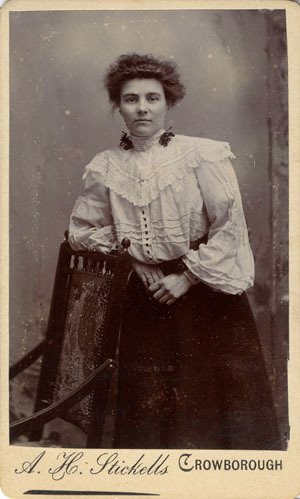 [ABOVE] A portrait of an unknown woman leaning on a chair, a carte-de-visite photograph by Ambrose Henry Stickells of Crowborough (c1903). 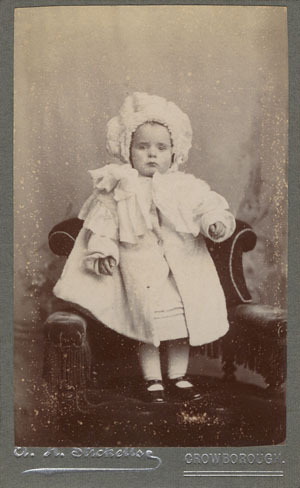 [ABOVE] A portrait of a toddler wearing a knitted bonnet, a carte-de-visite photograph by Ambrose Henry Stickells of Crowborough (c1908). [ABOVE] A carte-de-visite portrait of an unknown woman, photographed by Ambrose Henry Stickells of The Cross, Crowborough (c1898). 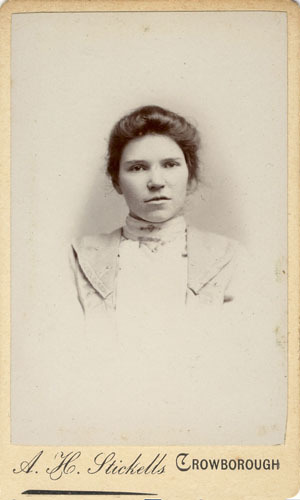 [ABOVE] A full-length portrait of an unknown woman, a carte-de-visite portrait by Ambrose Henry Stickells of Crowborough (c1906). 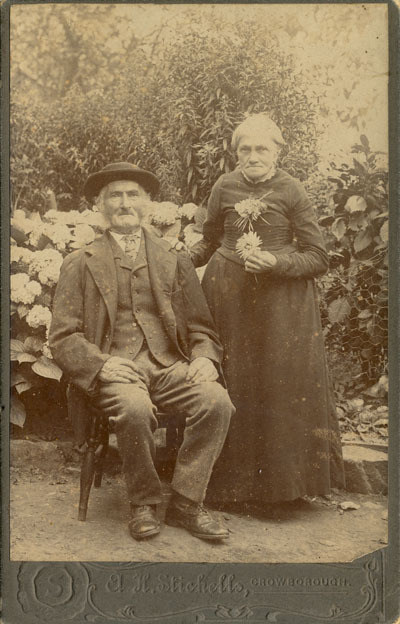 [ABOVE] A portrait of an elderly couple by Ambrose Henry Stickells of Crowborough, possibly taken to mark a significant wedding anniversary (c1907). 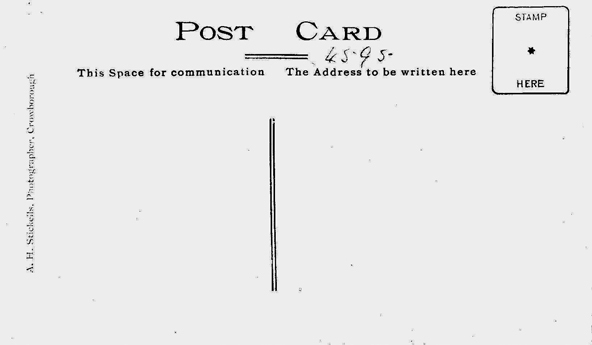 During the First World War period, the Crowborough studio of A. H. Stickells abandoned cabinet cards in favour of the more popular post card format. 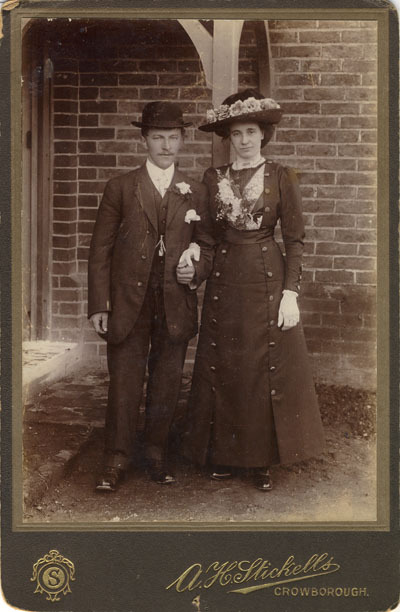 [ABOVE] A wedding photograph taken in 1913 by Ambrose Henry Stickells of Crowborough to mark the marriage of Alfred Philip Holmwood (born 1891, Rotherfield) and Harriett Emily Lelliott (born 1893). The reverse of the cabinet card is inscribed "March 29th 1913 - Phil Holmwood, Hart. Holmwood, nee Lelliott at Grannie Lelliott's House, Town Row"
[LEFT] A picture postcard portrait of a young woman, believed to be Ethel Hazelden of Buxted, produced by Ambrose Henry Stickells of Crowborough. 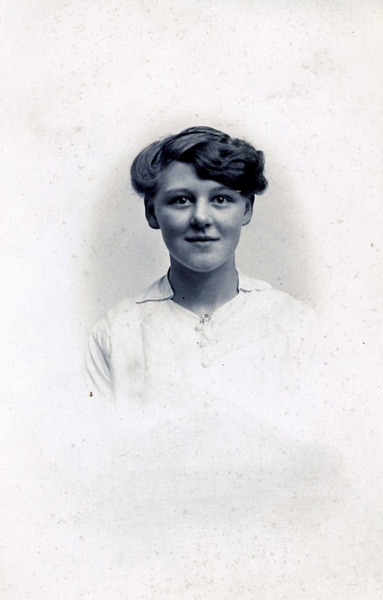 Ethel Hazelden was born at Rectory Cottage, Buxted, on 7th August 1900, the daughter of Charlotte and William Henry Hazelden, a gardener employed at Buxted Rectory. 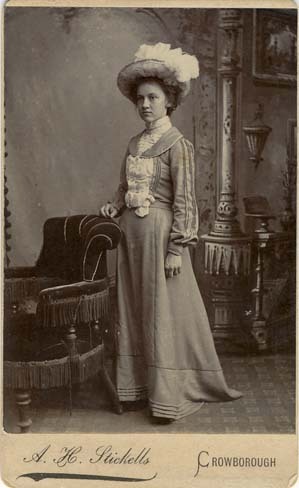 This vignette studio portrait was probably produced by A. H. Stickells around 1918. Eight years later, Ethel Hazelden married Arthur J. Bubb [Marriage registered in the district of Uckfieldduring the First Quarter of 1926].